If you were to ask me what my dream pantry would look like, I envision this walk in type of bright white room, housed with reclaimed wood pipe shelves from floor to ceiling. Complete with a repurposed screen door, with a quaint PANTRY sign. 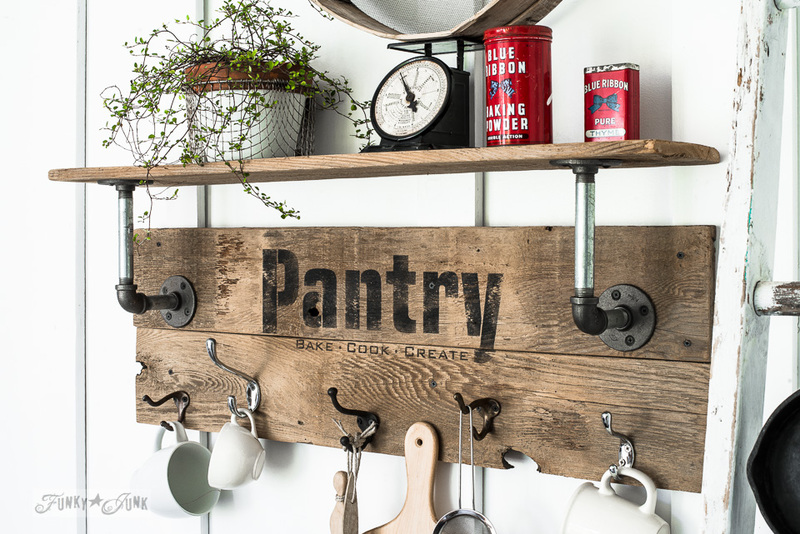 Since I don’t have space for that dreamy pantry concept, I DO have space for the look and feel on a smaller scale… with a funky industrial farmhouse shelf made from reclaimed wood and pipes. 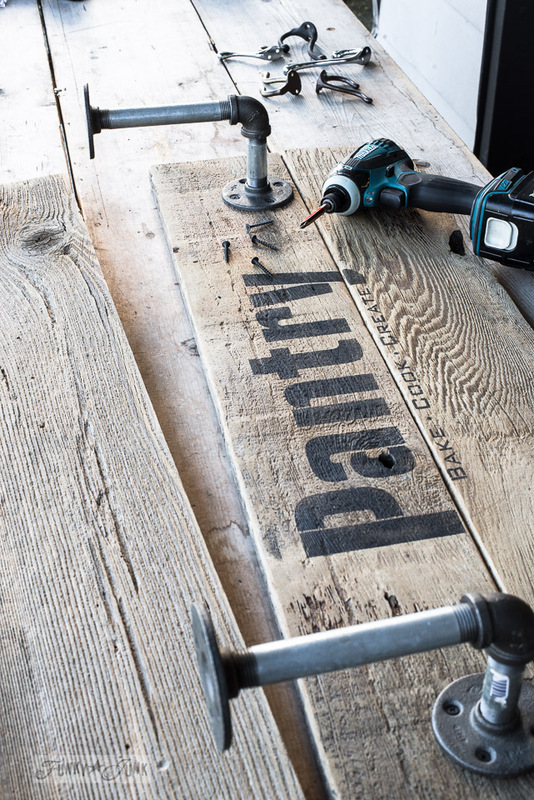 And you can bet a pantry sign came along for the ride! Does this shelf look a little familiar to you? I just showcased another way to display it in my revamped for fall front entry HERE. 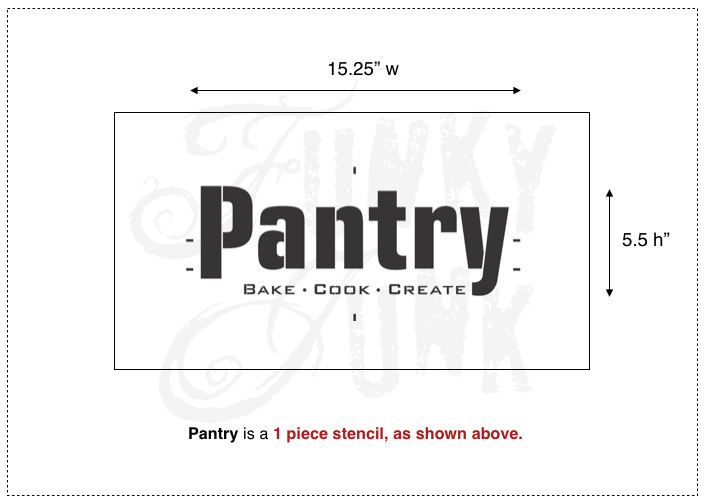 Introducing Pantry, at Funky Junk’s Old Sign Stencils HERE. 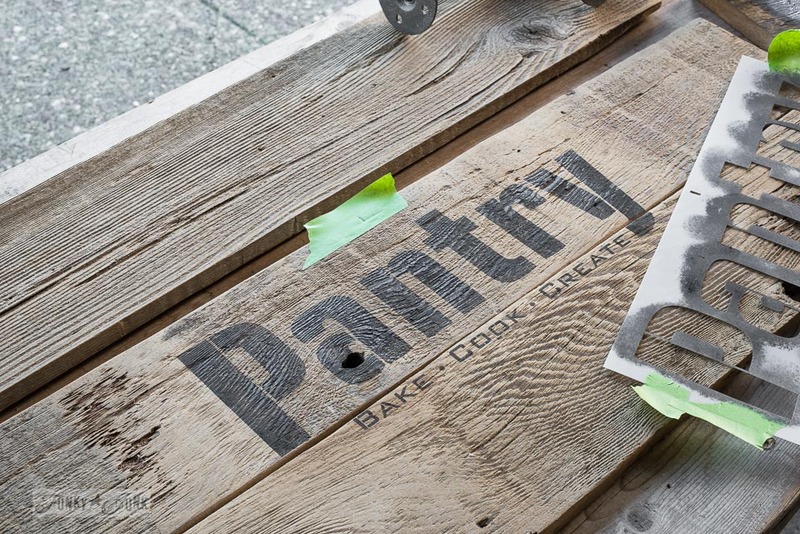 Pantry is one of the most requested stencil designs we receive, so we felt it was time to bring one to life! The design is bold, yet timeless. Upper and lower case letters offer a softer approach. Added subtext was added for market sign appeal, but was designed to be easily taped off if you desire a more simple statement. 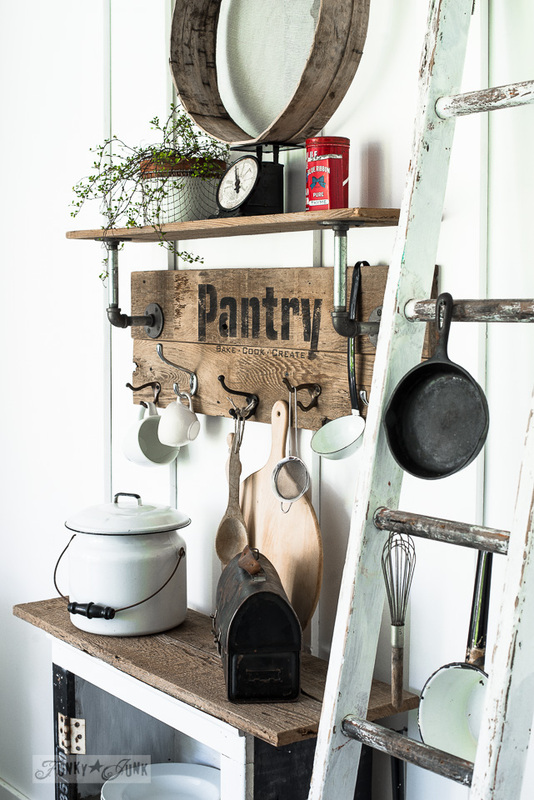 And this shelf project was a super fun, EASY project to whip up! Of course it could be used for anything. 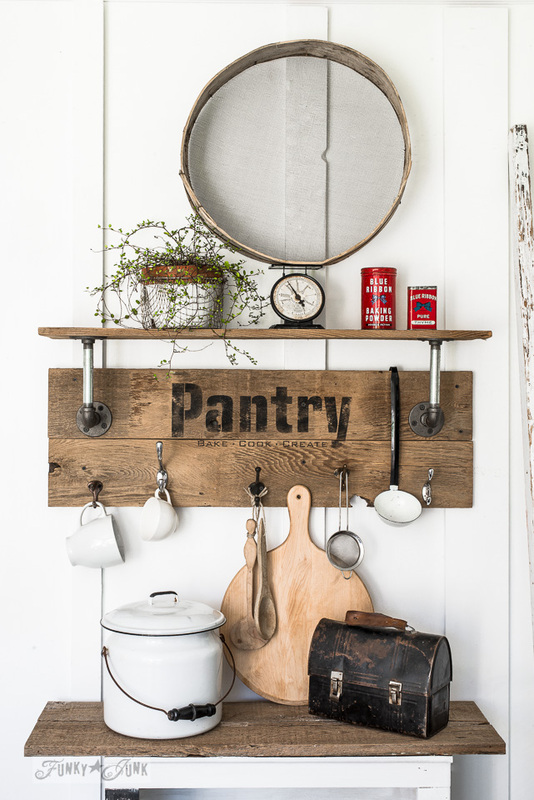 Think kitchen, bathroom, bedroom, outdoors, front entry… but here it’s decked out to pantry-fy your life. 1. Cut three planks to the same length, then give them a light sand. 2. Gather up the appropriate pipe fittings as shown. I used 3/4″ fittings. These were purchased brand new at the local hardware store. 3. 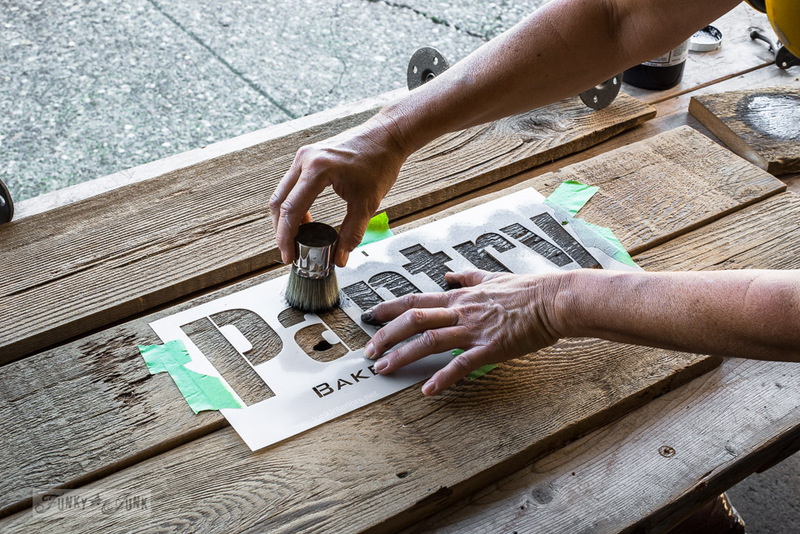 Position the Pantry stencil where desired, then masking tape into place. Positioning is made easy with this stencil, due to all the various registration marks. 4. Load a stencil brush with paint, then tap across the stencil. Tap the brush up and down across the stencil, walking your fingers along to hold each area in place while painting. I used Fusion Mineral Paint’s Coal Black for my paint of choice. 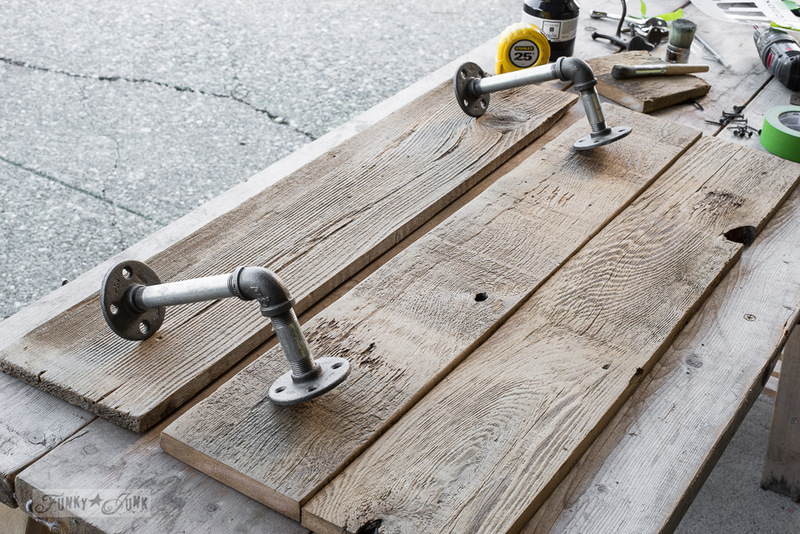 It dries so quickly, and leaves the perfect crate effect imprint on reclaimed wood! 5. 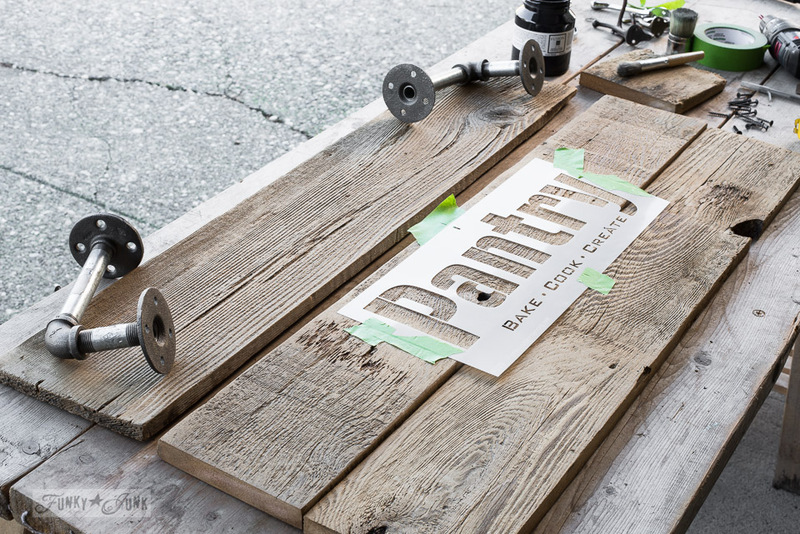 Once paint has had a chance to cure, lightly sand to distress, if desired. 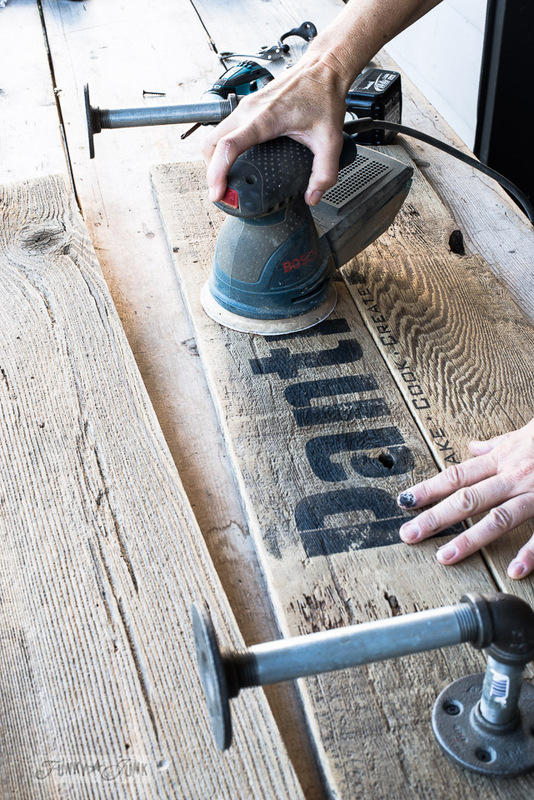 Tip: If you use a light hand in stencilling, you may be able to achieve this effect without sanding. 6. Dry fit the top shelf to help position the pipe fittings, then attach the short ends to the first plank with short screws, as shown. The pipes will become the support for the top shelf. 7. Apply random hooks along the bottom, and you are done! 8. Install was easy, everything was just screwed directly into the wall, one board at a time. But be sure to check out how I installed the shelf, and revamped it to suit my entry HERE. 9. And then I had fun! 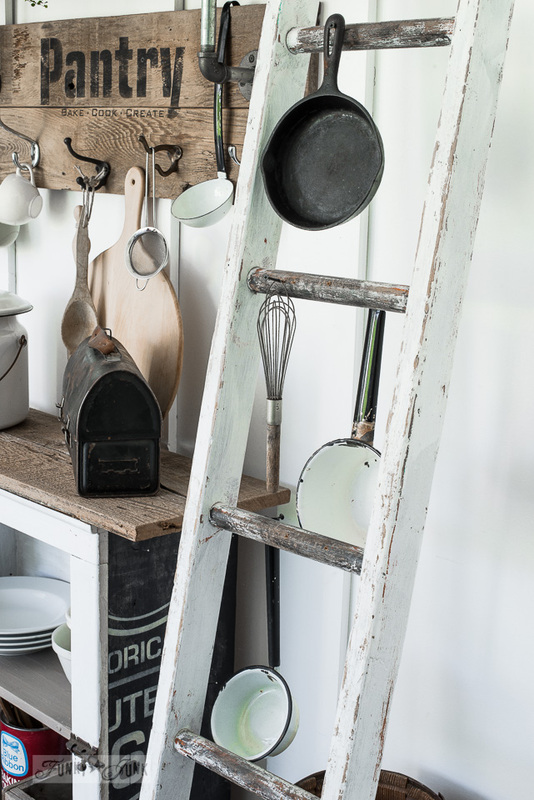 This was staged in my photo studio, until I can dream up a way of actually incorporating this look into my kitchen. I’m really diggin’ that shelf! 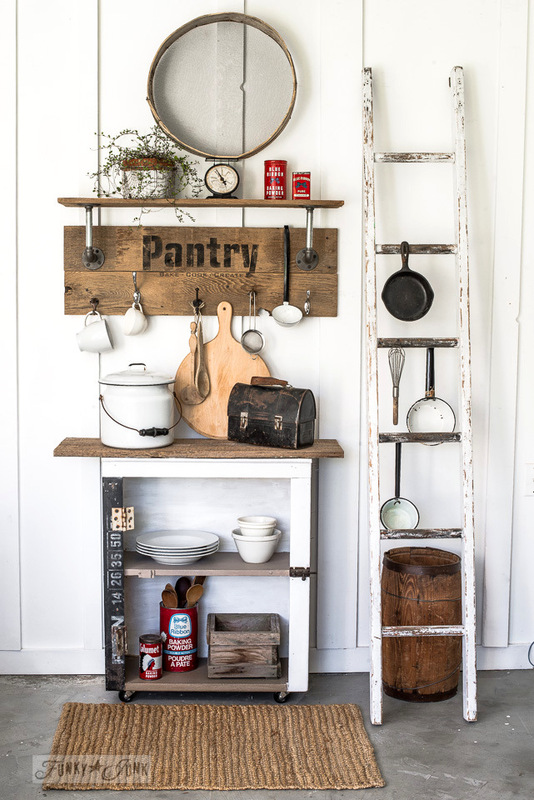 The ladder became a rustic pot and kitchen utensil holder. No building required here! I personally love the randomly placed hooks. It makes your things bounce around like they’re having one big happy pantry party, all beating to their own drum. 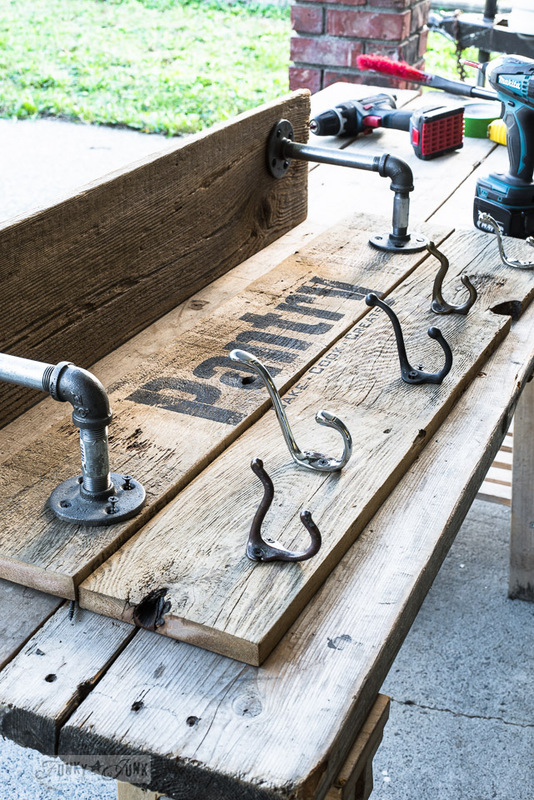 Weekend party hooks! But evenly spaced, aligned hooks would also look very smart, like they know what they’re doing. Big biz all the way. Office hooks? Boy, this would make one sweet coffee shelf with one of the coffee stencils HERE. Because the lower pipe fittings are mounted to a board, the top fittings are pushed out towards you a bit more. The deeper board will handle the entire top fitting. Being that the shelf is not supported against the wall direct, I kept the decorative items light. If you wished to add real weight to the top, you’d need some type of brackets to mount the shelf direct to the wall for added support. Add a little premade cupboard to the mix. Add planks along the top to extend the surface, and casters on the bottom, for easy moving and more of an antique look. 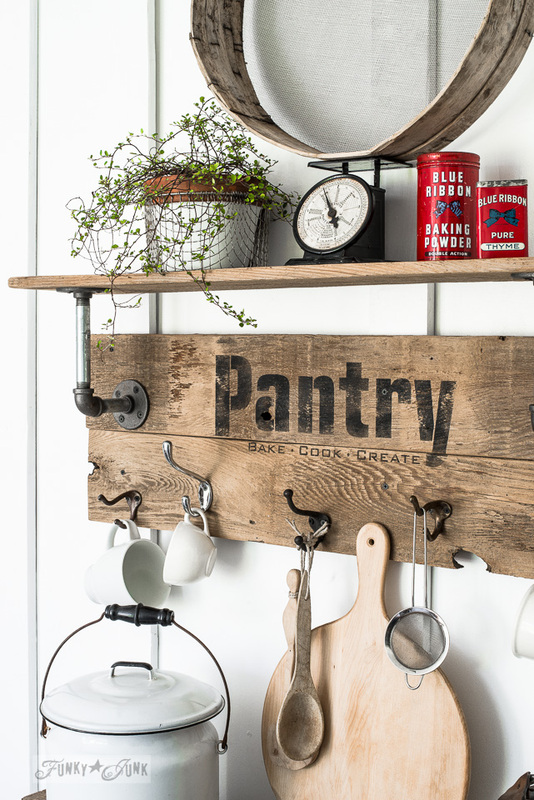 This fun project just about makes me think I could rebuild my entire kitchen with this look! 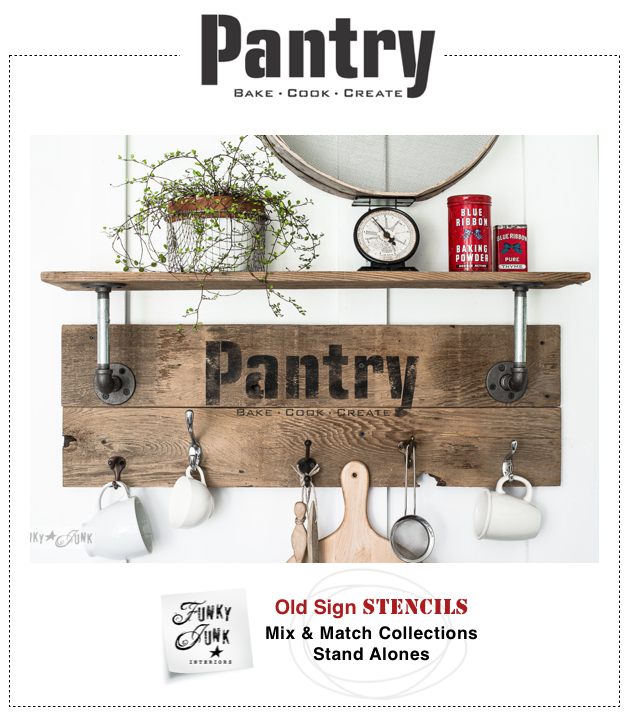 The Pantry stencil can be found in my store HERE. Disclosure: I work with Fusion Mineral Paint because I love the stuff, which is sent to me for free to create with. The stencils are from my own collection. Visit ALL my Old Sign Stencil projects below! That looks fantastic Donna, and I love the neutral and red items on display. Nicely put together. 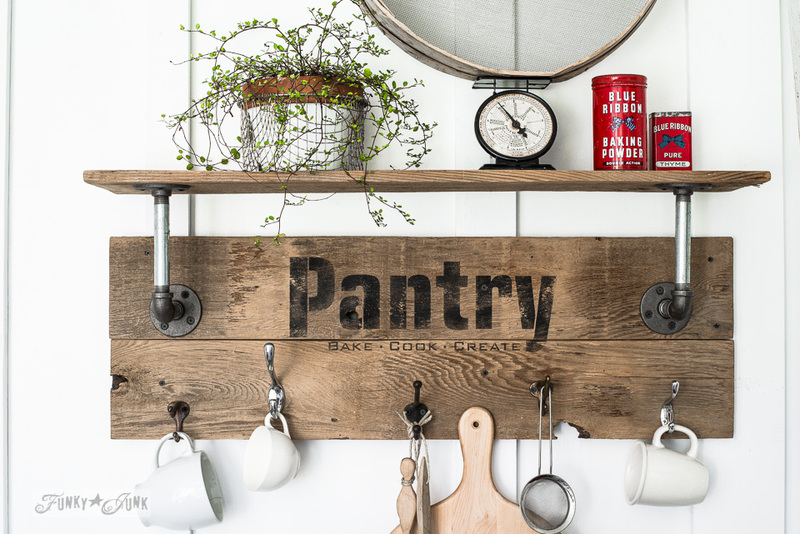 Your dream pantry sounds pretty awesome to me! Gorgeous display as always and I love the new stencil! I was working with your stencils tonight! Wonderful Donna! 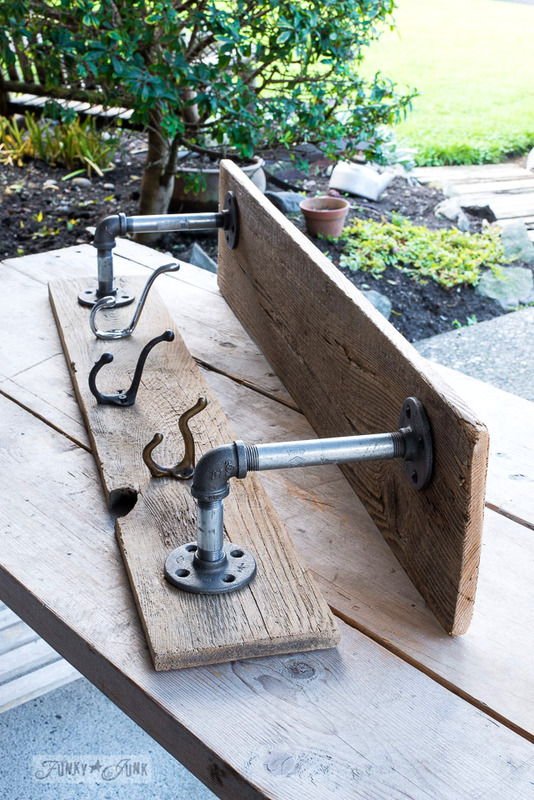 The reclaimed wood and pipe fittings really are suited to each other. Love it! Donna this is a fantastic idea, I would love this in my kitchen, keep up the inspiring work. SO cute! Now I need some of your stencils! Is this piece screwed right into the wall? Wondering about that…. THANKS! Hi Nina, yes! Each board was screwed directly onto the wall. Nothing fancy. Worked great! Hi there. Love your posts..Two questions on this project 1-when you say “Cut three planks to the same size” but then you say “the top shelf plank will have to be deeper” does this mean that they are not 3 planks of the same size? what exactly do you mean by deeper? The width should be longer? Hi Loanna! Thanks for asking, my original writeup was confusing. I’ve reworded the post and have also included another photo to better explain.